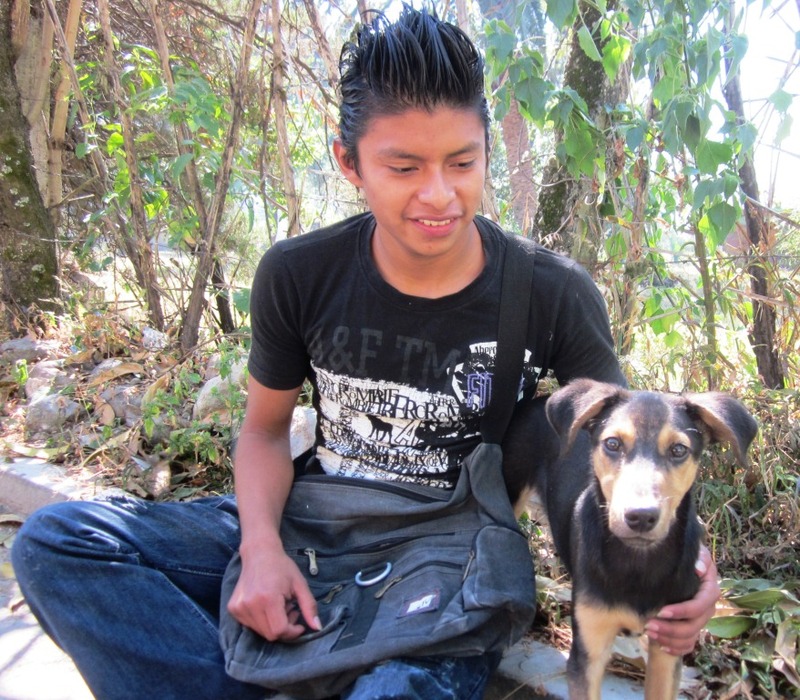 Francisco adoted Bubu when she was 3 months old; he has given her a wonderful home in San Antonio Palopo. Thanks to Francisco, Bubu has been sterilized and has completed her initial vaccination series. Happy New Year, dear friends and supporters! The final months of 2011 were full of activities wrapped around a whopping rain storm and seasonal fiestas. Truly a whirlwind of surgeries, treatments, meetings, financial planning for 2012, end the year reports, etc. One of the most satisfying accomplishments over the past year has been the development of relationships with three Guatemalan vets in 3 different cities. Through our partnerships, these vets provide negotiated low-cost professional services to Ayuda patients. We are happy to report that we have been able to hold our sterilization costs to $20-25 per animal. September brought our annual vaccination/re-vaccination campaign. Armed with copies of spreadsheets listing members of the Ayuda family, volunteers hit the streets in search of the “kids”. While some of us were vaccinating, others were fundraising to ensure enough vaccine to complete the campaign. We raised 93% of our fundraising goal for this campaign and went well over our goal to provide 300 combo vaccinations. The only hitch we encountered during our campaign was that Centro de Salud (Health Dept) ran out of rabies vaccine in the middle of the month. To date, they are still without this life-saving vaccine which means that Ayuda is out, too. We built solid partnerships with the Centro offices located in the different villages in which we currently work to provide all of our rabies vaccines for free. This is the first time we have encountered a complete outage and hope that the federal office will send us vaccines soon. We were visited by a 14-member World Vets team in October. Although we lost a clinic day due to weather conditions, the 2 days we spent in San Pedro went very well. They left us with a huge duffel bag and box of supplies that have helped us continue our daily activities. We look forward to the next team’s arrival in April 2012. During November and December we were back at our normal monthly run rate for sterilizations, vaccinations and medical treatments. Ayuda prinipals spent time preparing our annual financial report, new grant requests and cultivating a new relationship within the Santa Cruz community. The mayor’s team along with local leaders have welcomed Ayuda into their village to begin work in 2012. As a gesture of goodwill towards our partnership, we donated 25 dog combos, a large bottle of wormer, flea/tick treatments and a small bottle of Ivermectin to the Centro de Salud representative, Evelyn. She showed genuine interest in helping Ayuda with the local dogs and cats. Evelyn is responsible for injecting rabies vaccines for the CS office so there was very little training involved to bring her up to speed. It was great to find such a wonderful resource! A meeting with the Mayor-elect for Panajachel went very well, too. He has promised to support our program, intervene with locals when we need a little extra muscle and to develop a recognition program for local business that support Ayuda’s activities. We look forward to working with our new mayor in advertising Panajachel as an “animal friendly” international destination. 2012 promises to be another record-breaking year for Ayuda and for the dogs and cats in our region. Along with World Vets in April, we have another 4-person vet team coming from the States in May who will conduct 4 days of clinics in one or more villages. We have also been contacted by 3 diferent volunteer student travel groups interested in coordinating trips for vet students. Ayuda achieved 113% of its goal for sterilizations. There were 389 completed sterilizations vs. the goal of 345. Ayuda achieved 103% of its goal for vaccinations. There were 819 vaccinations administered vs. the goal of 790. Ayuda achieved 85% of its goal for emergency cases. However, falling short of this goal is viewed positively as a reduced need for emergency treatments during 2011. Ayuda achieved 100% of its goal for feedings. The goal was approximated at 10,000 feedings. Thank you again to the Brigitte Bardot Foundation, Marchig Animal Trust, World Vets, our dedicated volunteers and to all of you who helped make this a stellar year for Ayuda!